- Pets welcome with an additional $50 pet cleaning fee. What guests love about my home is the proximity: everything is a 5min drive away! Restaurants (The Loop! ), shops, Washington University, & Forest Park! 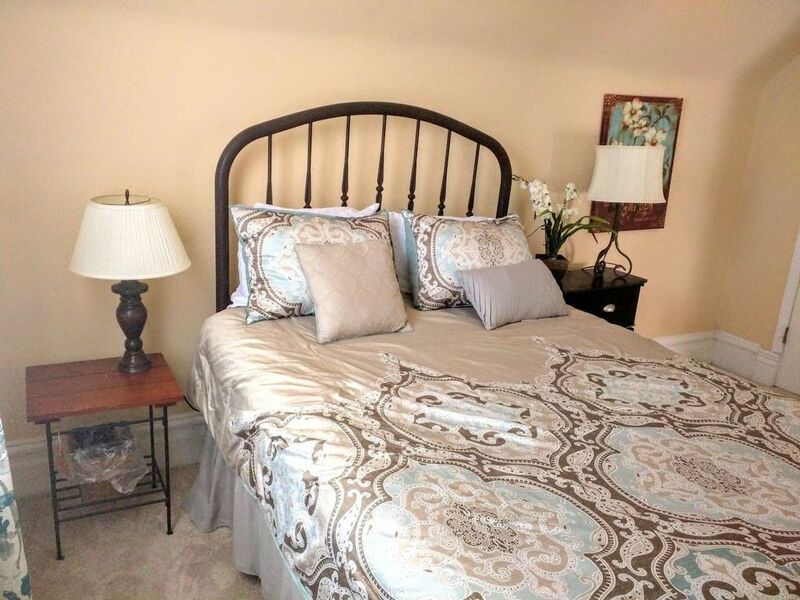 They also love the large, spacious bedrooms, and classic style. Some guests have commented negatively on the neighborhood, although it is a safe, quiet family street, in the midst of being gentrified, some houses are less nice than others but safe. Spacious, renovated home with classic wood floors. Two bedrooms, each furnished with a queen sized bed that comfortable sleeps 2 and drawers plus closet for clothing storage. The living room has a 46" Samsung Flat Screen TV, with Roku which transforms it into a smart TV to easily stream Netflix, Hulu, YouTube and more easily from your smart phone or computer. A super comfy couch and 2 sitting chairs. The kitchen is fully stocked with all the dishes, cookware, plates, etc you could need. Bathroom is stocked with towels, some toiletries, and a hair dryer. Situated on a spacious double lot. Fully enclosed, grassy backyard for children or people traveling with pets. Outdoor dining set for 4 with umbrella. Washer and Dryer also located in the basement. $50 Pet fee, we can only accept non shedding dogs and cats at this time. Simply let me know that you are traveling with an animal and I will adjust the rate for you. Please clean up dog droppings in the yard. Upon booking, you will be provided with an extension house manual which includes the code to the front door, allowing you 24hr access. You will be letting yourself in, but you can reach myself or my team nearly 24hrs a day via the messages on this booking platform if you have any questions. Spacious 2 story home near Washington University, the Loop (Restaurant Row) and Forest Park, with it's Zoo, museums and golf course! Renting a car is recommended, but you are close enough to Uber/LYFT to shopping, restaurants, a movie theater, music venue and more. When you book, I provide you with a coupon code towards your first rides. Well behaved pets are welcome for an additional $50 pet fee. I will consider non-shedding dogs that are traveling with a crate and cats. There is a large fenced in yard but note the neighbors to the left have dogs as well. -Please make sure to keep all pets off the furniture, pick up droppings in the yard, and leave them in their crate if they will be in the home alone. Hi! I'm originally from Maui, Hawaii, but have been living in and loving Boulder, CO for over 6 years now. I own a few homes in St. Louis, as well as ones I Co-Host for others. I have a Real Estate Investment & Vacation Rental Co-Hosting Business where I teach people how to find Properties to buy that make great rentals. I love traveling (44 countries and counting) and meeting travelers. I think hosting people is an incredible way to live vicariously through their adventures in between my own. I was a tour guide around the US, so I can be a great reference if you're on or planning a road trip. The house has not been deeply cleaned in years. There are cobwebs, dust, and dirty marks on the walls, doors, and floors that need to be scrubbed. Lightbulbs are missing in key areas like the stairway to the 2nd floor. We had to go out and buy our own detergent to wash literally everything. A fresh coat of paint would do a world of good also. The carpets need to be cleaned. We had to kill ants that were all over the kitchen. The drying rack for the dishes was absolutely disgusting. Even the cabinets were filthy and coming apart. We even had to use "drano" on the bathtub and bathroom sink to drain the water better. The house looks beautiful in photos, but it needs a deep cleaning. With better management, you could have a great time due to the proximity of the restaurants / bars / clubs nearby. The park, zoo, college, and museums are just 10 minutes away. However, this house is on the "other side" of Olive (not the expensive side of University City). Choose wisely. Read reviews. I'm a real estate agent, so I know how to help people find good homes. This is not the one for your family. It's more for a single person or couple who just needs a place to sleep while they explore St. Louis for a few days. You won't be hanging out in the direct neighborhood for sure. Very cute with comfy beds. The location is excellent! We were within minutes of everything we wanted to do. So much great food nearby. The Delmar Loop is a two minute drive and a fabulous street! Thank you for the great review! We hope to see you again on another trip to STL! Loved the house and surrounding area! We had a great time while staying here. It’s so close to everything! The longest drive we took was to the arch and it took no more than 15 minutes to get there. The restaurant recommendations out of the book in the house were spot on. My Yorkie loved the nice back yard too. Thanks for having such a great property available and for such a great price. Thank you for this sweet review, I am so glad you enjoyed our home! My daughter, my son and me each has their own bed which is hard to find in hotel at this price. Clear instruction to for direction, getting in/out and wifi access. Thank you for your sweet comments! We try our best to provide a lovely home at an affordable price! We would stay here again when in town to visit our family. Our dog loved the fenced in back yard, and we loved the spaciousness of the house. Very nicely and comfortably decorated for what we needed while visiting family over Thanksgiving. Maybe an extra sitting chair in the living room would be helpful, we were a family of 4 who would come home to catch a show or 2 before bedtime. The only issues we experienced were that we didn't have any paper towels/kitchen towels in the kitchen, until we realized on the last day they were all in the dryer, and we had some issues with the toilet clogging. Also, the smoke alarm beeped on and off the whole time even after we changed the battery. All very small issues when you look at what we had for our 3 days. Thank you for this feedback, we have already sent notes to the cleaners. I wish you would have let us know about these issues during your stay as they would have been a quick resolve. Great location! Home is neat and clean.